Figure-ground diagramming is an interesting and useful tool for analyzing spatial relationships in urban environments. It also provides a striking comparison of density and land use of older urban development compared to more contemporary suburban development. 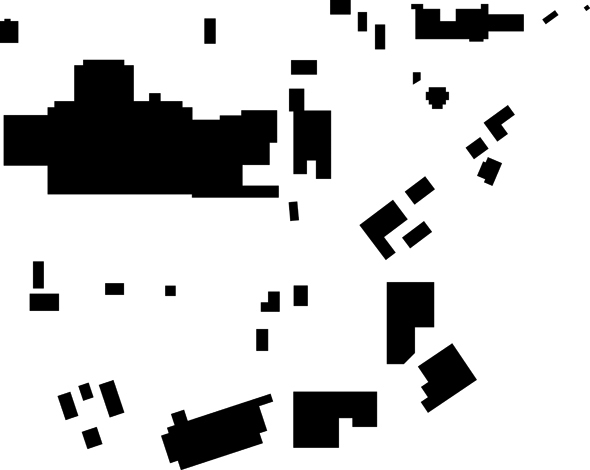 In older, urban places buildings typically took up the majority of space on a city block so even when diagramming built structure as figure (black) and space without structure (ground) the graphic would essentially depict the street grid. In more contemporary development however, auto-centricism has made for much more spread out buildings divorced from the street edge. Instead of relating to the street and sidewalk (if there even is one), these buildings related to their respective parking lots. Figure-ground diagrams of these sorts of places are often difficult to discern where roads actually go, but are very telling at the amount of open space wasted on the temporary storage of cars. 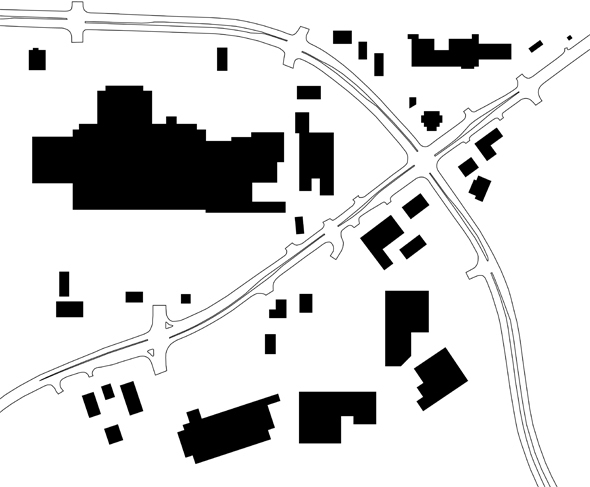 The figure-ground diagram above is an example of one of these suburban places that lack order and urban spatiality. They vast openness surrounding the buildings makes it hard to tell where roads go or even scale. The variety of building orientation in this case makes it even more difficult to decipher. In the image below, the roads are included, and we can begin to understand more about this space. 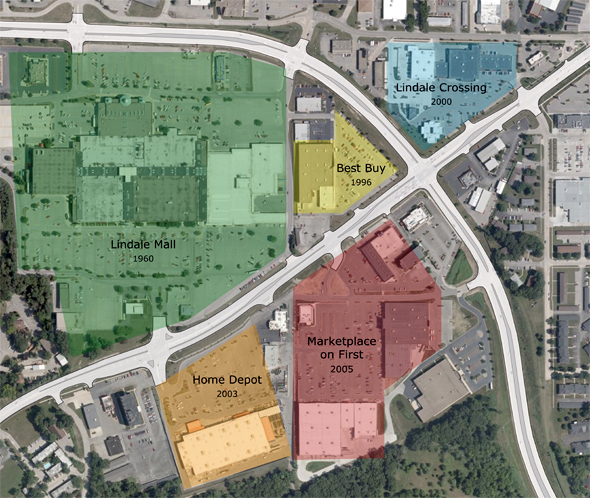 The diagram shown is of the Lindale Mall area in northeast Cedar Rapids, where First Avenue and Collins Road intersect. First Avenue is the road running diagonally from the lower left-hand corner up to the top right. I first decided to explore this area through figure-ground after noticing the actual corner of First Ave and Collins is very undefined. In fact, hardly any of the buildings in the study area relate in orientation or proximity to the street at all. In the image below I stitched together multiple bird’s eye views from Bing Maps. The predominance of pavement stands in stark contrast with the lush green, tree-laden land to the south. The awkward angles at which big box stores were built, situated far from the street, combined with sloping terrain, makes for a very haphazard, almost disorienting, landscape. Driving along First Avenue, the only thing definite is that you are constantly surrounded by parking lot. Asphalt abuts the street the entire length, with only a few small outparcel structures even nominally close. The area began developing in the 1960s, following the construction of Lindale Plaza, later enclosed as the indoor mall it is today. Besides Lindale, most of the larger scale retail developments there today were only built in the last ten years or so, as older properties were redeveloped. These recent redevelopment areas comprise a significant amount of the First Avenue corridor, and every single one disregards site context and has little relationship to the street. How unfortunate since these will ultimately remain for at least the next few decades. So why is this a problem? The chaotic development pattern makes finding particular businesses – especially while driving – more difficult, and is very inconvenient for pedestrians. Even if the area had a complete sidewalk network, going from place to place would take much longer on foot than if buildings were closer to the road. I also don’t think massive parking lots make for a very attractive street environment. Now I’m not advocating no parking, but what if the placements of all these buildings were simply switched with their respective parking areas? If buildings were located by the street and parking placed in the rear, it would be more accessible and equitable to those arriving on foot, bike, or bus – while still serving car customers just as well. With buildings all along the street, it would reduce the distance between places, making it easier for people to get to multiple stores and restaurants in the area on foot. In the current setup, it’s likely most people will get back in their cars just to drive over to the next store rather than walking. Aesthetically, the street would be much more attractive with a well defined edge. This would provide the area a stronger sense of place and urbanity, instead of the anonymous suburban scape that exists now. Distance-wise, the mall and surrounding development is really quite close to a large residential area, just a few blocks down First Avenue, but right now there’s not even a sidewalk from around 40th Street up until the mall, where then, there is only a partial sidewalk along the south side in front of Home Depot. Even so, if a continuous sidewalk existed, psychologically the perceived distance from nearby homes would be quite long due to the spread out configuration of buildings. Built-up density makes walking distances seem shorter, while vast open space – like parking lots – makes distances seem longer. If newer buildings like Home Depot and Marketplace on First had been built up to the street, this area would already look and feel more dense and closer together. With a more urban scale, nearby residents may find walking or catching the bus (pending improved transit service) to be more convenient than driving the five or six blocks to the mall. Unfortunately the current setup encourages and almost necessitates driving. I don’t expect this area to ever drastically change, especially since many of these developments are relatively new, but I do hope that other new large and small scale commercial developments will be more respectful of the street and accommodate customers arriving by all different modes equally. Urban design is not only about how the environment looks, but about how it is organized, oriented, scaled and proportioned. Good urban design can have a profound impact on the accessibility, usability, and sustainability of new developments. One year ago today, on Wednesday, June 11, 2008, historic flooding was underway in Cedar Rapids. My third summer as a seasonal employee with the Veterans Memorial Building maintenance crew, I had a very involved, first hand perspective of the flood in downtown and public facilities. Working at the Veterans Memorial Building, better known as City Hall, which sits on Mays Island in the middle of the Cedar River in downtown Cedar Rapids, I watched the river rise daily and got regular updates and break room commentary on surrounding areas from my elder co-workers who lived outside the city. I remember watching the river rise through downtown the previous summer so up until the day or two before, it really didn’t seem like it was going to be that big of deal. Of course, official crest predictions continued to go up, and an additional downpour that Thursday pushed the river to crest at an absurd 31+ feet, breaking the old record by almost ten feet. Even during the flood and immediately after, I didn’t seem to grasp the enormity of its affect. Originally I figured we could be back in the building clearing out and cleaning up within a few weeks and have the building back up and running. Who would’ve known it’d be a year later, the lower levels cleared out and down to bare-bones, with little more than a possibility of the City offices one day returning. At work, the greatest day of urgency was on that Wednesday, June 11, the day before the building and much of downtown were completely overtaken with water. I recall arriving to work around 8am as normal. I walked from the GTC, where I commuted to by bus, past the riverwalk along the eastern bank of the river. The river level had began to rise above the lowest part of the walk, near 4th Avenue. Smulekoff’s, which sits directly next to the river, was clearly taking on water with a number of hoses from the basement pumping it back into the river. Water was also being pumped out of the underground Mays Island parking garage, which had begun to seep in a day or two before. This morning the river level was inches from topping the river wall lining the mid park section of the island and only four or five feet from the road beds of the three bridges. As I got into work, water had already begun to seep through the walls of the “underground” – an addition built underneath Second Avenue in the 1960s which connects the basement of the original structure to the underground parkade, also constructed at that time. Originally the location for emergency management and various other offices, the space had been condemned for a number of years due to falling pieces of concrete from the ceiling (below the street), and was essentially a large, half-demoed space used for storage, trash, and recycling sorting. Attempts to block or patch the wall seepage were no good and water quickly began flowing into the public hallway through the underground. We set up some sandbags by underground’s connection to the original building and set up a hefty pump to try to keep it down. Throughout the day city office workers from upstairs were carting boxes of city legal records and other documents stored in the basement up to the auditorium on the first floor – which of course, turned out to be in harm’s way anyway as the final crest was two feet above the first floor. I took two or three trips to Public Works in the dump truck to pick up pallets of sandbags that day. Volunteers were working around the clock filling sandbags for city and private use. I had trouble even getting in with the line of cars waiting to get their ten alloted sandbags. City vehicles were able to drive in to be loaded with full pallets. While in line one a woman was handing out free pizza and told us to “Keep up the good work.” As the situation worsened, cooperation and morale ran high. Returning to the building with my first load, just about noon, I encountered heavy traffic. Congestion around public works and downtown as people rushed to prepare homes and businesses, along with the closure of the 3rd Avenue bridge made a normal five minute trip, take more like 20 or 30 minutes. It had begun raining at that point, making the enduring flooding seem even more dire. When I finally made it to the First Avenue bridge, I pulled into the east alley by the building and started unloading the sandbags around a basement window opening before breaking for a quick lunch in the shop. Rain clouds cleared in the afternoon as work continued. Lots of people were downtown – many came as onlookers, and many came to help. Two guys who were walking by helped us unload another truck load of sandbags in front of a west side entrance to the mezzanine level. Back to public works for another load – surface level flooding becoming much more apparent in low areas a few blocks from the river. On my last trip back to Mays Island, police were diverting westbound First Avenue around 6th Street West due to water now over the road (in lower areas, not all the way from the river). I was allowed to go through as I was just going to City Hall. 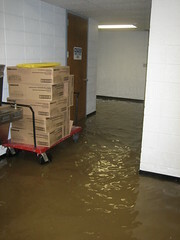 Towards the end of my work day I helped the two night guys move supplies from the basement up to the dining room on the mezzanine level – again a futile effort as this room was entirely submerged the next day. Before leaving the building around 5pm, I went to the roof to get some pictures of the river flooding from all angles. At this point the 3rd Avenue bridge had been closed as water was but a foot from the road bed now. 2nd Avenue bridge was closed about an hour later. Eventually all river crossings in the city were closed except for I-380. The next morning, Thursday, June 12, it was raining hard. I had planned to go into work early but the building and much of downtown had already been completely inundated. That day, at home, we had to deal with rain-related water coming into our basement. My brother Daniel was also hurrying to move guitars and equipment from his recording studio about seven blocks from the river – just in case. He and his business partner had just signed a lease for a larger, more permanent space in downtown Marion so they simply moved much of it to their new location. I went along to help them out in the afternoon as rain was still coming down – and the river still rising. After finishing up we decided to walk a few blocks toward the river where the water had now reached past the 4th Street railroad tracks in the downtown core. Many National Guard officers were on the scene keeping the public away and out of the water as volunteers continued sandbagging buildings close by. We didn’t stick around very long. The next few days were to watch and wait. Many businesses outside of downtown were closed as accessibility throughout the city was extremely hampered with 380 being the only river crossing for days. With three of the city’s four collector wells being flooded, conserving water was also critically important. Most businesses and residents obeyed mandatory water restrictions, refraining from doing laundry and showering for days. The Cedar River finally crested at around 31 feet early afternoon on Friday, June 13, taking thousands homes and hundreds of city blocks. Pretty much confined to the house as my summer job was under water and most businesses remained closed, that Sunday was a less than average Fathers Day, I imagine, for most of the community’s dads. My brothers and I went to see our dad that afternoon out at Kirkwood, where he had spent the past few days reporting news on the flood at KCCK radio. This was my first time crossing the river since the floodwaters had submerged much of downtown, and certainly Mays Island. Though water had already recessed a number of feet, the view from 380 was no doubt dramatic. I finally returned to work the following week on Tuesday, the 17th, meeting my VMC co-workers at the Police Station to start picking up sandbags and debris, along with some guys from the city parking division. As transit serve had not resumed yet, my mom gave me a ride there. After passing a checkpoint many blocks from the station, we drove down blocks of empty streets surrounded by empty houses and no people. It was very surreal. All downtown bridges were reopened and transit service resumed Wednesday, the 18th, with limited service so I took the bus to work. A temporary transfer site was set up at 4th Ave and 12th Street SE, and buses were not allowed to pick up or drop off any passengers inside the still access-controlled flood zone. Since I was to report back to the police station, they allowed me off with a show of my city badge. With the same crew from the day before, we finished picking up sandbags at the station and then headed across the river to pick up bags at the public library. Private clean up crews were already well underway at the Great America Building across the street and downtown was beginning to buzz as debris piles began filling the curbs. A few days later my first return to the building was to help take photos of damage, which can be seen here. We entered through a side door to the mezzanine off the loading dock ramp. Our view as we entered can be seen in the photo below. Everything inside was covered in mud, plaster and paint falling off the walls, and an unrecognizable darkness. Water still had not receded out of the basement so the mezz was as far down as we could go. Up on the first floor, which had taken on about two feet of water, the old wood auditorium floor was completely ruined as were many artifacts in the Spanish American War Memorial room that served as the VMC office. Over the next few days as water went down to a foot or two in the basement, we recovered the gas pump we had been using the previous and set it up to pump out the remaining standing water. We now had a couple state troopers for 24/7 security, as we took turns “watching the building” – essentially just refueling the pump whenever it ran out. I spent many long days just sitting by the First Avenue doors watching the cars go by. Not surprisingly, it took at least a week or two for professional cleanup crews to start picking up Vets Memorial, while many other buildings were already underway. Although I was not in position to actually do any cleanup work, they did need someone from our department there at all times as a go-to person and to unlock and lock the building at the beginning and end of the day. Like watching the pump, many afternoons, evenings, and Saturdays were spent simply sitting around at the building. I got to know our regular Per-Mar security gang, which replaced the state troopers as security. Other than that, the night crew and I spent much of the rest of the summer out at Veterans Memorial Park, by the stadium, which is also owned by the Vets Commission. After returning to Ames this past year for school, I tried to keep up with recovery news from the Gazette and other sites, but it was hard not to disconnect from the flood. With the few days I was back in town for Thanksgiving and Christmas it was hard to gauge the progress. At spring break time in March, downtown had been pretty well cleaned up and many major businesses had returned. But work continues for smaller businesses and other less visible areas, like New Bohemia, Czech Village and Time Check. I was fortunate to be home then to participate in one the Neighborhood Planning Process meetings, which will help guide redevelopment as the community continues moving forward. So now it is one year later. The Cedar Rapids Downtown District is marking the flood’s anniversary with a three day RIVERenaissance celebration, kicking off tonight with a flood documentary and flood time capsule presentation at the U.S. Cellular Center at 7:30pm. Other events include a 7 mile river run on the perimeter of the flood zone and “Floodstock” to raise money for continued flood recovery. When I was in Denver about a month ago, I took a short driving tour around the newly established Stapleton neighborhood, a massive redevelopment project underway at the former site of Stapleton International Airport. The largest New Urbanism project in the United States (according to Wikipedia), Stapleton is designed to be a more sustainable, community-oriented, mixed-use neighborhood. I was eager to check out the progress. Green space was plentiful throughout the progressing development. A large Central Park is complimented by meandering greenways and tiny neighborhood parks. Streets are pretty much laid out in an efficient grid system with occasional deviation. Different areas sport different housing types and styles. Most are based on regional and traditional precedents and are all oriented toward the public street. Prices range from $80k townhouses up to $900k estate homes – view them all. Stapleton brings back the alley, providing access to garages behind the houses. The fronts of these homes are no longer dominated by garages for cars, but porches for people. Most of the homes sit on compact lots so garages take up much of the back yard, so the front yard and neighborhood park spaces become the place for outdoor recreation and relaxation. This is believed to foster community and more interaction with neighbors. Sustainability is a key focus of the new Stapleton neighborhood. Tangible measures include building all ENERGY STAR homes that are more energy efficient, some with solar panels; LEED certified office buildings; and recycling old runways and parking lots into new streets, bike paths and sidewalks. Additionally, nearly 27,000 new trees have been planted in Stapleton, and the new Central Park, greenways, and pocket parks have increased the amount of parkland in the city by over 30 percent. Sustainability is not only about energy efficient buildings, but also planning, diversity of uses, and aesthetics that promote sustainable lifestyles and community. As mentioned above, streets are pretty much laid out in a grid system and connect at many points with the existing city road network. This is more efficient than the typical suburban road hierarchy of cul-de-sacs and short local streets feeding into collector streets and major arterials. Typical suburban subdivisions provide only one or two routes in or out, often making one walk or drive a longer distance due to convoluted curving roads and lack of thru streets. They also cost cities more to maintain because each street only serves a small number of residents. So grid street systems provide more direct access and route alternatives, distribute traffic more evenly, permit more efficient distribution of utilities and services, and minimize maintenance of excess roadways by maximizing the use per person of each street. Proximity to places of work, stores, restaurants, and schools is also essential for a neighborhood’s sustainability. This reduces the need to drive so much for everyday needs and conveniences. Generally amenities within half a mile is an acceptable walking or biking distance. With over two million square feet of retail planned when completed, the Stapleton neighborhood certainly has a mix of amenities and residential. However, pretty much all the retail and commercial has been developed (and is planned for, according to Stapleton land-use maps) on the western edge near Quebec Street, so it is not as integrated with housing as it could be. Also a majority of the current retail is in the form of a dressed-up big box power center and a lifestyle center / mall, essentially your typical upscale suburban shopping center. 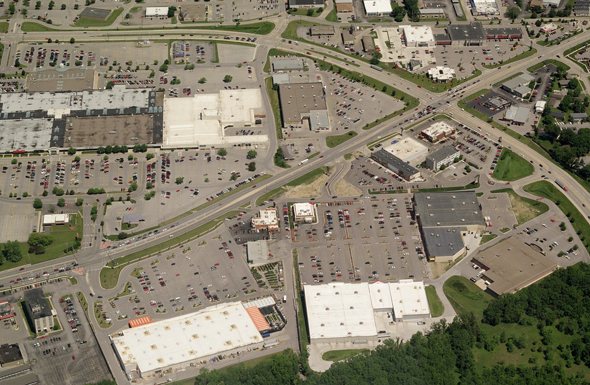 Current commercial and retail space is concentrated in three distinct main shopping districts. East 29th Avenue Town Center is the quintessential “main street” area so commonly found in New Urbanist developments. It is a relatively small area located on the west side of Stapleton along Quebec Street. Pedestrian scale one to two story shops and buildings are built up to street like a traditional downtown Main Street, with plenty of parking concealed in the back. This particular retail area is well connected to the new residential blocks, some right across the street. 29th Ave Town Center is at a main entrance into Stapleton along Quebec Street so it is able to serve both the newer residents of Stapleton and those of older existing neighborhoods across the street. Another, less pedestrian retail area is Quebec Square, just north of the E 29th. Ave Town Center area on Quebec Street. It is a typic big box power center with Walmart, Sam’s, Home Depot and several national retailers and quick service restaurants. Although clearly car-oriented, there does seem to be effort made to maintain a grid of streets through the center and minimize the visual and physic disruption of massive parking lots by locating most buildings at corners and along the edge of roads. Despite it’s suburban nature, Quebec Square is still reasonably accessible from housing in the Stapleton neighborhood with connections via the street grid sidewalks – longer than a 5 – 10 minute walk for most residents, but quick trips could easily be done via bicycle. One more major retail area is Northfield Stapleton, an open-air, lifestyle center shopping mall about a mile north of the center of Stapleton on the opposite side of Interstate 70. Following the trend, Northfield provides a faux Main Street shopping environment with decorative streetscaping and pedestrian scale store fronts. This is deceiving as the entire perimeter is surrounded with a massive parking lot and outlaying box stores. In satellite view, it appears the street ways through Northfield were designed for future expansion in mind – so the pedestrian storefronts could eventually extend beyond the original main street. Unfortunately these pedestrian friendly arteries will always end in a car-friendly parking lot. Despite the distance, there is no real direct pedestrian access from the residential areas of Stapleton to Northfield so inevitably even nearby residents will have to drive here. One last retail center on the eastern edge of Stapleton is yet to be developed. Eastbridge Town Center, planned at the intersection of MLK Jr. Blvd and Havana Street will be 29th Ave’s counterpart. So eventually the residential core of Stapleton will be flanked by two pedestrian friendly commercial zones. Stapleton seems to be very walkable with appropriate pedestrian provisions and will only get better as the neighborhoods are filled in. However, my initial reaction was that residential areas were too segregated from commercial areas. I figured it’d be much more integrated and mixed. The distance between many homes and shopping would require at least a 10-15 minute walk one way, not bad, but perhaps not enough to keep someone from driving instead if the errand was urgent enough. A quick trip could be made by bike or frequent transit service though. Connectivity to the rest of Denver is also critical for the sustenance of Stapleton, as many residents are employed outside of the neighborhood. The neighborhood’s transit plan is pretty extensive with a bus hub planned with numerous direct routes to major employment centers throughout the metro. The future RTD train service to Denver International Airport will go through Stapleton, providing a direct connection to Denver’s expanding light rail system. See maps for more information about the neighborhood transportation and land use. Another mixed infill neighborhood was underway in Denver a year before Stapleton Airport even closed. I discovered Lowry, less than a mile south of Stapleton, on Google Maps, as they appear very similar in aerial plan view. Lowry is smaller than Stapleton at only about three square miles, on the former site of Lowry Field and Air Force Base. From quick Googling, it seems Lowry may be a bit more suburban in form than Stapleton, but still much improved over typical suburban housing. At about 80 percent build out, completion of Lowry is expected within a year. All photos in this post are from Flickr user faceless b / EPA Smart Growth.